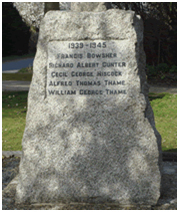 The War Memorial is located on the east side of the road to Bishops Green. The piece of land on which it stands, some 19 square yards, was owned by George Edward Stanhope, Earl of Carnarvon, who was lord of the manor of Ecchinswell. It was part of the "waste land" of the estate, originally the site of the pinfold or village pound. 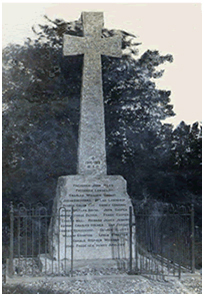 After the end of World War 1 money for building a war memorial to the fallen soldiers from the parish was raised by public subscription. 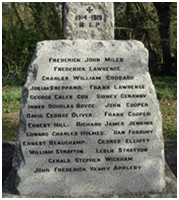 On 1st October 1921 the Earl of Carnarvon conveyed the piece of land to the Parish Council, to be used "for the erection thereon of a permanent memorial to the officers and men of the Parish of Ecchinswell and the Parish of Sydmonton who fell in the Great War". 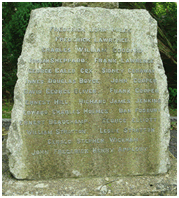 The site of the memorial was to be held for the benefit of the inhabitants of the parishes of Ecchinswell and Sydmonton and to be held in perpetuity by the Parish Council. The conveyance was signed and sealed by the Earl of Carnarvon and by Andrew Kingsmill (Chairman of the Parish Council) and by Albert Ernest Booth and William Trigg (members of the Parish Council). 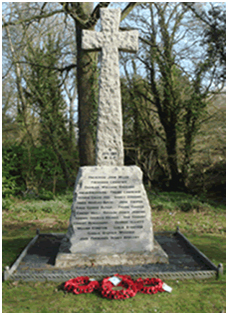 The front face is inscribed with a memorial to the First World War of 1914 – 1918, honouring the 21 who lost their lives, as well as the 21 people who served and returned. 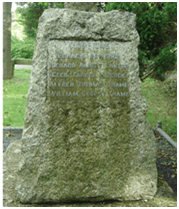 In 2008 the Parish Council made a sucessful application to the War Memorials Trust for a grant towards the cost of renovating the war memorial, and in December of that year the Trust awarded a grant of 50% of the cost of renovation works. The works, which entailed cleaning the memorial and replacing/repainting some 20 of the letters on it, are now completed. These photographs (right) show the improvement resulting from the renovation.